It’s that time of the year again. The best chess players in the United States will once again reunite in the world capital of chess, St. Louis, as they get ready for the most important national competition of the year: the 2018 U.S. Championship & U.S. Women’s Championship. The tournaments are scheduled to start April 17 and conclude on April 30, when the winners in each section will be declared the 2018 champions. Both tournaments will include the 12 best players this nation has to offer in their respective sections, as they compete for the highest laurels in a round robin format. Each player will play every other competitor, and the victor will be declared after 11 rounds, with potential tiebreaker games in case of a tie. From a fan’s perspective, this year’s field is one of the most stimulating ever. We have the usual suspects, the big three of American chess – Fabiano Caruana, Wesley So and Hikaru Nakamura. On top of that, we have maturing super talents such as Jeffery Xiong and Awonder Liang. There are also dangerous veterans such as Alexander Onischuk (who is being inducted into the U.S. Chess Hall of Fame) and Varuzhan Akobian, who has had an amazing 2017 and will surely look to impose his style in the upcoming weeks. 2017 U.S. 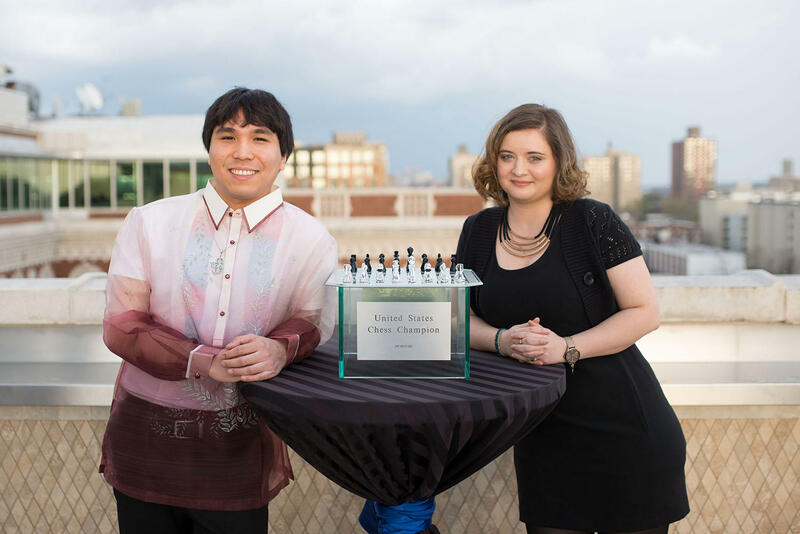 Chess Champion, GM Wesley So and the 2017 U.S. Women's Chess Champion, Sabina Foisor. Even more, this year’s championship brings a huge novelty. Caruana, the current No. 1 American, won the Candidates Tournament just two weeks ago, which granted him the opportunity to challenge Magnus Carlsen for the World Champion chess crown. In November, the two titans will battle it all out for the undisputed world championship title. No American since the enigmatic Bobby Fischer in 1972 has managed to reach these peaks. Of special note, there are three players in the U.S. Championship field who have competed in every one of the last 10 U.S. Championships: Alex Onischuk, Var Akobian and soon-to-be Webster University graduate Ray Robson. Last year’s Women’s Championship saw one of the most dramatic and suspenseful finales ever witnessed. The clear underdog, Sabina Foisor, took the title after a dramatic final round, peppered with aggressive mating attacks and unexpected surprises on all the boards. This year, Foisor will no longer be the underdog, but the returning champion. The pack of chasers will surely do everything in their power to dethrone her. This year’s rating favorites are seven-time U.S. Women’s Champion Irina Krush, as well as five-time champion Anna Zatonskih. These veterans will surely give Foisor everything they have. Nevertheless, in the mix, we also have young talents such as Jennifer Yu, Nazi Paikidze and Tatev Abrahamyan. Similar to the men's championship field, there are three competitors who have played all 10 U.S. Women’s Championships hosted by the St. Louis Chess Club: Irina Krush, Tatev Abrahamyan and Sabina Foisor. This eclectic pool of talent will have fans on the edge of their seats, as they await the ceremonial first move to be made on April 18 at 1 p.m.
Watch all the action at the club, including commentary by grandmasters Robert Hess and Eric Hansen, or online at uschesschamps.com with the outstanding commentary team of Yasser Seirawan, Jennifer Shahade and Maurice Ashley. For those who “hablan Español,” tune in to our Spanish commentary with Alejandro Ramirez and Ivette Garcia Morales. Chirila is currently the head coach and resident grandmaster at Bay Area Chess, and has made his way into the Grandmaster in Residence rotation at the Saint Louis Chess Club since its opening in 2008. He has also appeared in St. Louis to add to the live broadcast coverage of tournaments. Chirila will be the journalist and live tweeting the 2018 U.S. Championships.